Promote and celebrate your small business marketing solution! What exactly is “visual marketing”? Simply put, visual marketing is the part of your marketing plan that involves visual media. Any type of media — print, “new”, or on site. Hello. We are David Langton and Anita Campbell and we are compiling a new business book celebrating visual marketing solutions for small businesses. The book will contain 99 case studies celebrating excellence in visual marketing online, in print and on site. Wiley Publishing will release the book in the fall of 2011. This is a great way to get some publicity and recognition for your work and business. Right now, we are reviewing examples of visual-based marketing solutions that promote small businesses in unique and unexpected ways. Projects should have definitive results in increasing sales and marketing awareness and may be print-based, online solutions, or environmental solutions. Projects must have been created for small businesses (1,000 employees or less) and completed in the last two years. How to submit your project. Use our online form when submitting your project. You will be able to type in contact and project information and upload a low-res image. All projects must be submitted by April 25, 2011. There is no limit on the number of projects you can submit for consideration. There is no fee to submit a project for consideration. If your project is selected for the book, you will receive more information on submission requirements, including hi-res art requirements. We will also be arranging a quick interview so you can tell us the “inside scoop” on the project. All contributors will retain the rights to their projects and will authorize a one-time use of the design for the book. Feel free to pass this message along (or blog about it) to anyone who might be interested. 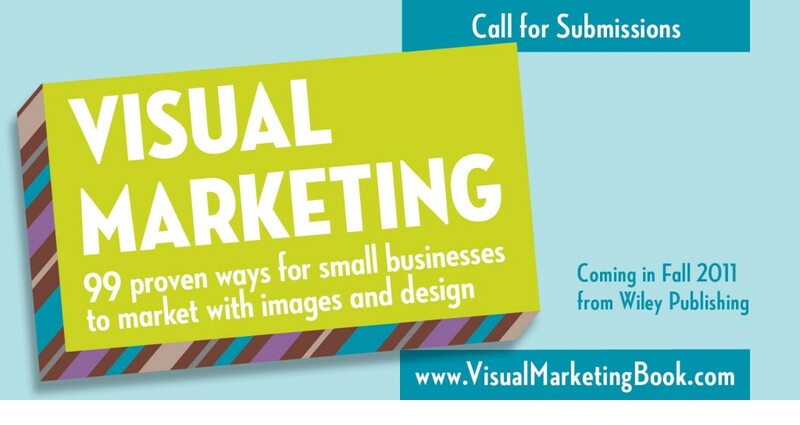 For more information contact hello@visualmarketingbook.com.